Corroflon™ was launched in 1978 and, since then has been continually updated and improved. 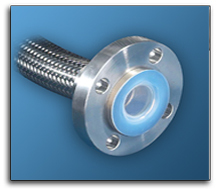 Now it is the industry-standard convoluted flexible PTFE hose for major chemical, pharmaceutical and food companies worldwide. The Corroflon™ design differs from every other PTFE hose on the market, which results in distinctive and measurable performance and safety advantages.